At Papillion Sanitation we appreciate you! Our valued customers are our best source for referrals, and we want to reward you for all your efforts. If you are a current Papillion Sanitation residential garbage customer, you can refer a friend in any of our residential service areas and earn one FREE month of residential garbage service. 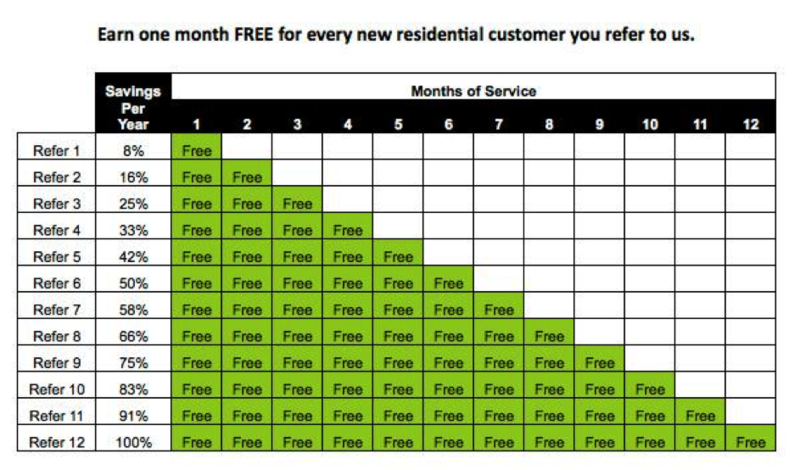 In fact, you can earn as many as 12 months FREE per year for referring 12 friends that become residential customers! Visit Papillion’s website, and click on the Referral button at the top. Complete and submit form. Tell your friend to call 402-346-7800 to sign up and have them mention your first and last name. Still not sure if services are offered in your area? Enter your zipcode here to find out if Papillion Sanitation services are offered in your location. At Papillion Sanitation, we appreciate our customers trust and value their opinions. We’ll do our best to continue to perform the kind of quality service you deserve. Still have questions about how our referral program works? Contact Papillion Sanitation at (402) 346-7800 to speak with one of our courteous customer service representatives.